The Communion Veil: "I'm Here." "Well to fall in love, you have to spend time with someone. I didn't fall in love with your Father just by spending one hour with him once a week. We talked, shared, spent time in a kind of 'adoration' of each other every day. It's the same. "But you don't have to right?" "I don't have to do anything, that is what free will is. But because I do love Him, I want to go, I miss Him if I don't or can't go. " "Why is so important to go to Mass? Wouldn't your time be better spent if you helped the homeless or something? Isn't that what Jesus would want? It seems kind of boring to me." "My child, you don't know what is happening at the Holy Mass. Let me try to explain. First of all charity is always important, but there is nothing in the world that has more benefit for souls than to go to Mass. In the Mass, heaven itself is opened and God comes down at the words of the Priest and is truly present, in the Eucharist, the communion. And we who are present have a unique opportunity to plead to God for the souls of those that are lost to Him, purifying their souls in the process." "Think about it this way, do you think there was any way Jesus' Mother would have gone shopping on the day that he was being tortured and crucified?" "No...no way, she had to be there!" "Why? Did Jesus need her to be there?" "Well, yeah, you want your Mom when things are going bad." "If He was God, and He was, He didn't 'need' her because He is God, but that is not to say He didn't want her there, just like He wants all of us." "Do you think Jesus loved his Mother?" 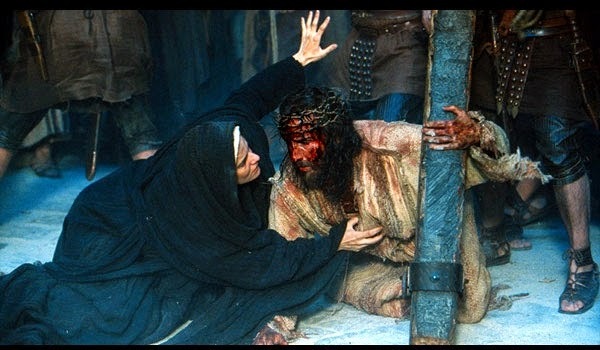 "Then if Jesus loved His Mother, and wanted her present at His suffering and death, and knowing Jesus's love for us, how much more does He want us to be present at the Holy Mass when the cross is 're-presented' on the earth?" "I go to Mass everyday because I love him and I need him. Unfortunately, in the past as is now bad things are happening in the world, and sometimes I just say to Him in His suffering.... "I'm here." How I wish wisdom like this would come to me when my daughter says, "Mass is boring." Wonderful post!